Have you ever wished you could shop at a store that had the same style and charm as The Barn? You're in luck, because now you can do just that! The Barn's sister store, Vaqueras, just opened up in the cutest old building in downtown Russellville, and we know all you die-hard Barn fans are gonna love it! The Barn's owner and creative director, Lesleigh Smith, brought a little piece of her beloved Texas to Russellville when she opened Vaqueras this week. She spent the winter handpicking gorgeous western goods worthy of the most stylish vaqueras (that's "cowgirls" for all you non-Texans out there!). This lady is superwoman! She not only runs the best wedding venue around, but she has now curated the most beautiful selection of fine western wear, beautiful boots, gorgeous accessories, and the prettiest leather goods. There is nothing in Russellville (or anywhere close) that even compares! Lesleigh described Vaqueras best when she said it's like The Barn + Kacey Musgraves (our hero) opened a store together! Seriously, y'all, this place is GOOD. Even if you're not THAT western, you're sure to find something you'll love at Vaqueras. I'm not a western type girl at all, but I've already eyed several things that need to get in my closet asap. 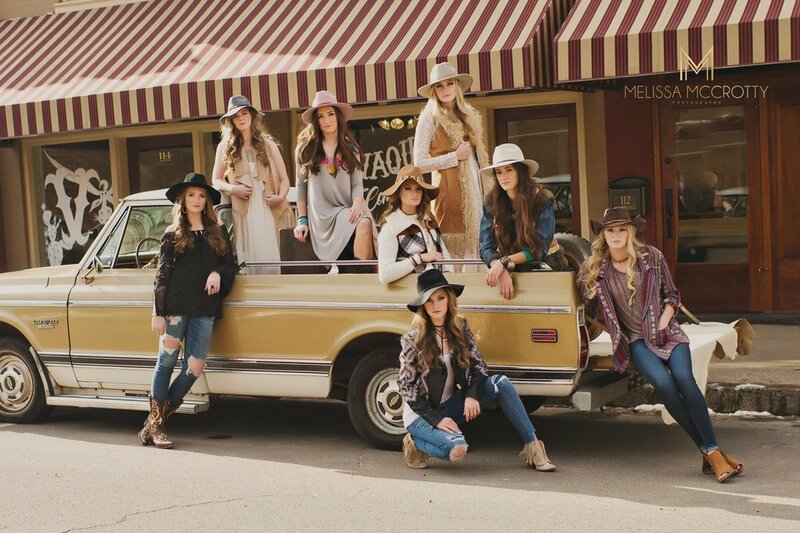 ;) Vaqueras had a photo shoot with Melissa McCrotty a few weeks ago, and Lesleigh styled some of Melissa's senior models in some fab western wear. Lesleigh and Melissa worked with a team of super talented vendors to pull off this shoot, and it turned out perfectly. To see all the beautiful clothing, boots and accessories Vaqueras has to offer, check them out on Facebook and Instagram! You can shop Vaqueras in person at 114 S. Commerce Ave. in Russellville, Arkansas.